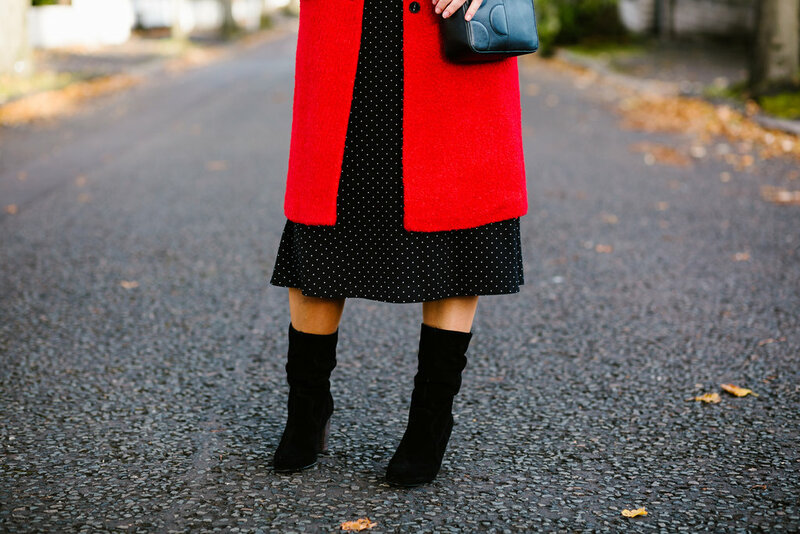 As the seasons change, I've been asked a few times what to do about the cold leg issue when wearing midi dresses and skirts. I have it covered girls...in a couple of easy steps! First up, fear not the flesh tights. For years now, I've been buying my flesh tights from Dunnes and I know they're not a store that is found widely in the UK but the good news is that you can buy these online. They're £4 for two pairs and the colour you need to get is Chiaro. Now I appreciate that if you're darker in skin tone than me, these won't work but for anyone with equally pasty Irish skin, they're absolutely amazing. Not too sheeny, which is important when you want your legs to look like you don't have tights on....the whole point of flesh coloured tights! Did you guess I was wearing them in the images here? That's how good they are. Next up, midi boots. Now I've struggled with this style of boot in the past because they tend to hit my leg at the widest part and so when wearing over jeans, they would be tight on me and less than flattering. 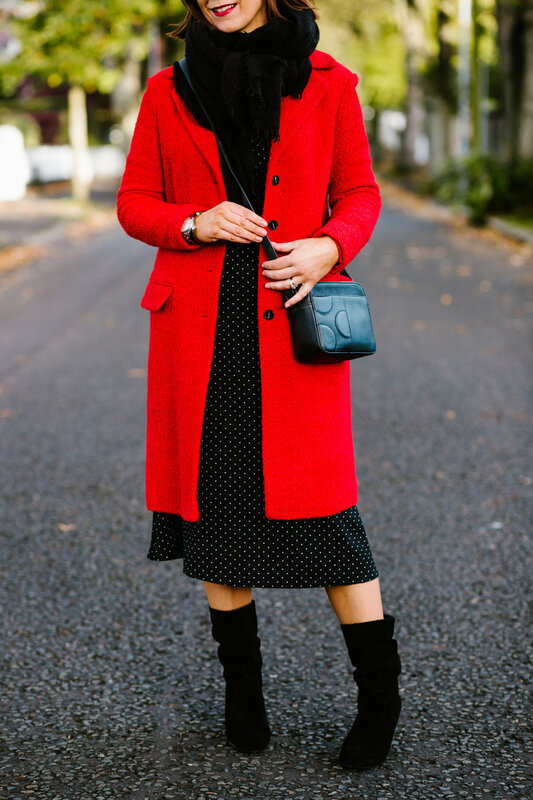 But then the eureka moment hit when I realised how fab they are with dresses AND they give you that bit more leg coverage, helping with the dress wearing in cold weather. AND you can put woolly socks inside them #bonus. These boots are from Next and are one of my finds of the season. Genuinely the most comfortable heeled boot I own and so easy to pull on and off. 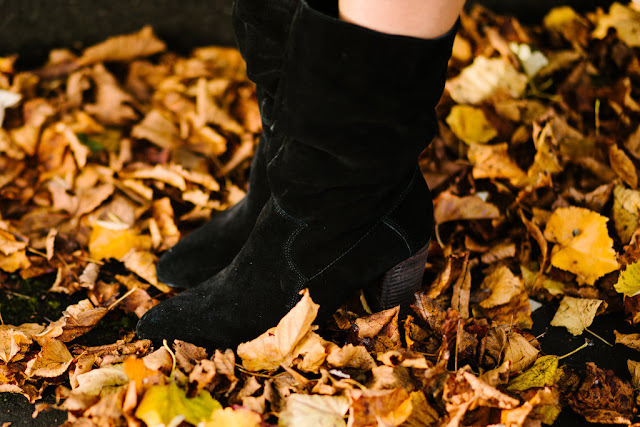 The suede is lovely and soft and the shape is so flattering for wearing with dresses. They sold out so fast the first time they appeared online but they're coming back in again so you can order now for delivery in 2-3 weeks. The brick colour way is gorgeous too.....so tempted. A complete steal at £65. 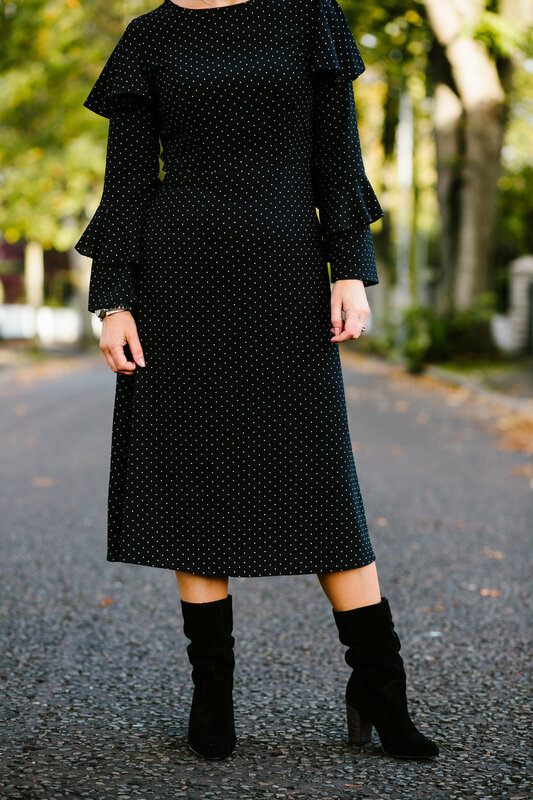 Top half next and if you have a sleeveless or low cut midi dress, simply layer it with a polo neck. It's such a great look for this season. The best ripped polo necks are these ones from M&S. 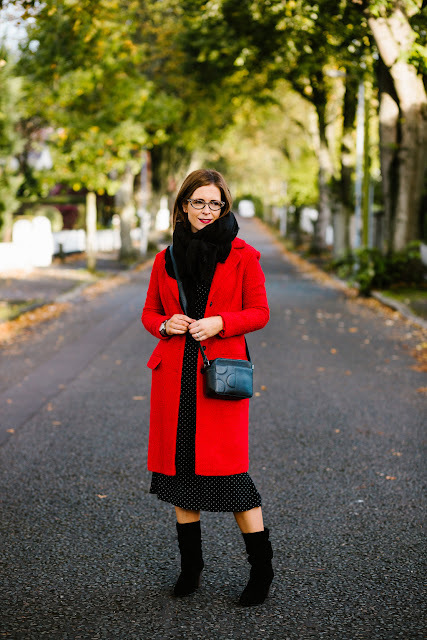 I was always in the mindset of wearing a shorter jacket or coat with a midi dress and there was that 90's style rule where you had to match your coat with your hemline, which made me think I couldn't wear my mid-length coats with a midi dress. Well that hemline rule has been blown out of the water so go ahead and throw a mid-thigh coat over your dress. It shows off what's underneath but most importantly, it keeps you cosy! This coat is also from Next and I can't speak highly enough about it. 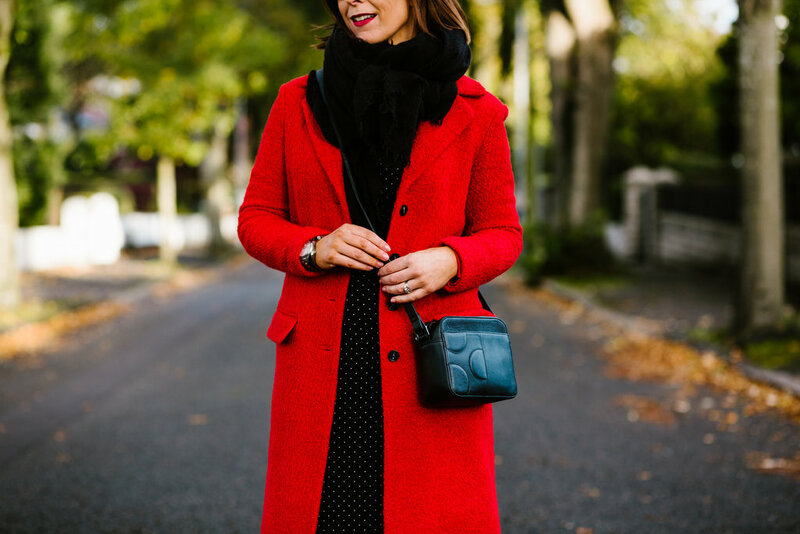 It's only £68, a cosy wool mix and it's the most flattering shade of red. I sized down to an 8 but if you want to wear knitwear underneath, stay with your usual size. And of course, queen of the scarves that I am....get a big cosy one around your neck. This is the plain Zara one that they have every season. Make sure you have a grey and black scarf like this in your wardrobe and you'll never want for a scarf to go with something. So so versatile and really cosy too. 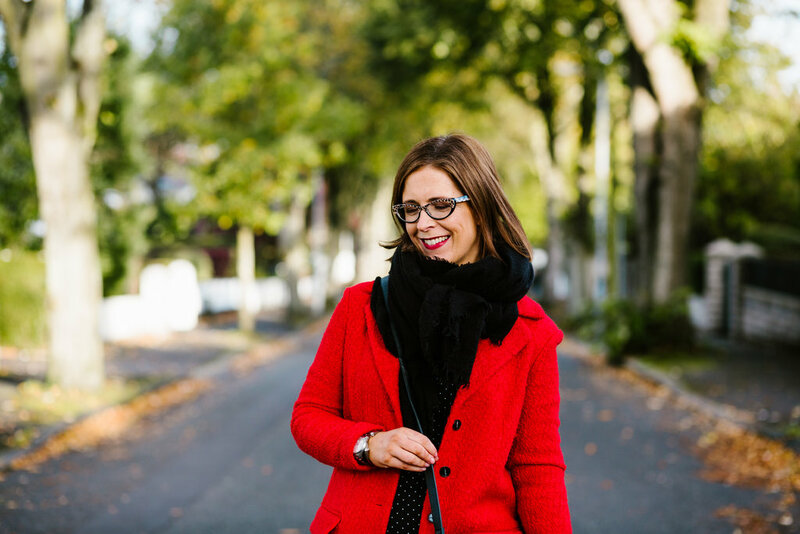 The material in them is great for adding warmth and volume without the bulk you get from lots of blanket scarves. So apart from a few lighter/summery print dresses, I'm keeping all of mine for autumn/winter and working them hard! Thanks for recommending the boots Avril! I've just ordered the brick colour. Unfortunately the black was already sold out in my size but as you said the brick looks good too! !